← AU SET TO REPLACE WESTERN PARTNERS WITH CHINA? 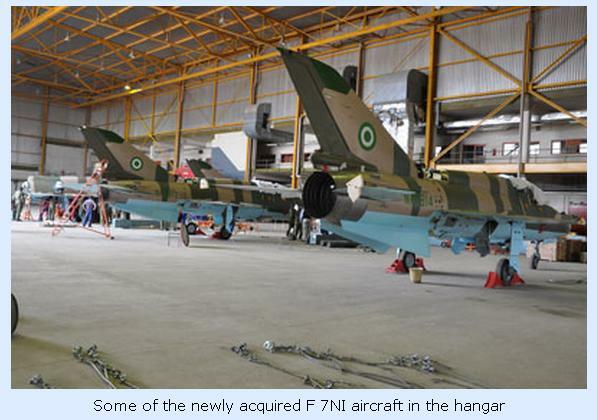 The Nigerian Air Force (NAF) has revealed that it has now taken delivery of all 15 of its new Chinese-made F-7 combat aircraft as part of a continuing process to modernise the service. The new fleet comprises 12 CAC F-7NI combat aircraft and an additional three FT-7NI trainer aircraft, which will replace the existing MiG-21 ‘Fishbed’ fighters that have been grounded for several years. Essentially the new fleet will allow the NAF to operate a genuine combat aircraft for the first time in a number of years. However, at present only the FT-7NI trainer variant has entered service. News of the delivery was announced as the NAF celebrated its 46th anniversary with an Air Expo which, with the induction of the FT-7NI, included the formal commissioning of the ATR 42 maritime patrol aircraft (MPAs), and the AgustaWestland AW109 light utility helicopter into air force service. All three types have been acquired as part of a long-overdue recapitalisation programme funded through the NAF’s annual USD382 million budget. Since December 2009 the NAF has taken delivery from Alenia Aeronautica of two ATR 42 MPAs fitted with Galileo Avionica’s Airborne Tactical Observation and Surveillance Systems (ATOS). In addition, it has also procured a single refurbished ex-Italian Air Force G.222 transport aircraft from Alenia as part of a deal to upgrade five aircraft in its exisitng G.222 fleet. A first pair of what may be as many as 13 AW109 helicopters were delivered in February of this year, although this final number has not been confirmed. The two helicopters were inducted into service by the 305 Flying Training School at Enugu. The Nigerian cabinet has also approved a contract to purchase five refurbished AS 332 Super Puma helicopters from France for operations in the country’s Niger Delta region. The procurement drive is matched by a series of reactivation projects, which include overhauls of the NAF’s Lockheed Martin C-130 Hercules transport aircraft and Aero Vodochody L-39ZA armed jet trainers. The US Air Force has assisted in this effort by renovating a single C-130 to an airworthy standard in order to enable a more thorough overhaul to be conducted in Europe as Washington tries to assist in developing an indigenous airlift capability in Africa. Meanwhile, 12 modernised Aermacchi MB-339CD jet trainer/light attack aircraft are due to re-enter service following an overhaul by Alenia under a 2006 contract. In order to address the serviceability issues that have plagued the air force’s fleet of aircraft in recent years the NAF is also working to develop in-country maintenance capabilities with partnerships between its wholly owned Aeronautical Engineering and Technical Services Limited (AETSL) and companies such as Alenia Aeronautica, AgustaWestland and BSVT of Belarus. “Aggressive negotiation of new and informed renegotiation of old contracts” has allowed the NAF to optimise its limited resources, Air Marshal Oluseyi Petinrin, the NAF chief of air staff, said at the mid-May Air Expo. *British Type 226 Skyranger radar: Ranging radar that weigh 41 kg with a range of 15 km. *British Type 956 HUDAWAC: This HUD has a build-in weapon aiming computer, hence the name ‘H’ead-‘U’p ‘D’isplay ‘A’nd ‘W’eapon ‘Aiming ‘C’omputer. *American converter that is over 30% more efficient in comparison to the original Chinese converter. *American Type 0101-HRA/2 radar altimeter with range increased to 1.5 km in comparison to the original 0.6 km of the Chinese radar altimeter it had replaced. * British AD-3400 secured radio with range in excess of 400 km at 1.2 km altitude. *Other improvement includes domestic newly designed CW-1002 air data sensor developed in conjunction with the western avionics, and WP-7B/WP-7BM engine. *A totally different wing enabled the take-off and landing distance to be reduced by 20%, while increasing the aerodynamic performance in dogfights. According to customers’ claims, F-7M(of which the F7-NI is a later development) is nearly 40% more effective than MiG-21 in terms of overall performance. It can use French R550 Magic and PL-7 Air-to-air missiles. This entry was posted in AFRICA, AFRICAN ARMED FORCES, MILITARY HARDWARE, MILITARY PHOTOS, NEWS & REPORTS, NIGERIA, NIGERIAN AIR FORCE, NIGERIAN ARMED FORCES, NIGERIAN ARMY, NIGERIAN NAVY and tagged DEFENCE & SECURITY, DEFENCE NEWS AND REPORTS, F7-NI AIRGUARD, GEOPOLITICS & STRATEGIC STUDIES, MILITARY ACQUISITIONS, MILITARY HARDWARE, MILITARY PHOTOS, NIGERIAN AIR FORCE, NIGERIAN ARMED FORCES. Bookmark the permalink. At least this mixture of dumm platform & smart avionics should lunch the Nigerian Airforce into modern avionics experience. It is a smart choice as the Airforce needs is minimal & they do not have the technical competence and experience to manage more expensive Western Aircraft like the BAE-SAAB Gripen or the French Rafael. Hopefully they do not slip into comatose again for decades. Hello Gen. Rommel, I do not totally agree with you that the Nigerian Air Force lacks the technical capability to manage those birds. If they saw the need they would acquire them. Only that the FG of Nigeria does not see the need to spend our precious reserves just to buy toys. nigeria is not being threatened by any strong nation today, we can manage the china jets for 10years. but plan for 15 russian su-27 superior combat jets, india can afford it, why not nigeria in future? cameroon may attack us one day, we need air superiority. the best way to avoind war is to be so well prepared,that your enemy fears to try attack on you, just like America makes everyone fear to attack USA ! nigerian navy needs a small aircraft carrier and navy jets for ECOMOG use on west african sea, e.g for an attack on ivory coast as recommended by ECOWAS and UNITED NATIONS today,in order to save ivory coasts democracy. Nigeria has no strong opposition neither is there an external aggression from her immediate neighbours.the main reason for the race in combat planes in developed countries is due to external aggression or opposition/competition from its immediate neighbours. i m serving in pak air force since 18 years and my total experience is on F7 aircraft.if i join the nigerian air force what will be my pay? Its obvious the Nigerian Airforce is under no current threat from its neighbours but the purchase of 3rd generation fighters in an era where 5th generation aircraft abound is unforgivable. If countries like Eritrea and Ethiopia can procure Mig-29’s and Su-27s,why should the Nigerian Airforce settle for less. In the event of a dogfight you need to have more advanced avionics than your aggressor and i think the airforce should think in this direction rather than have its planes shot down and then re-invest in quality aircraft. i totally agree with el duderino, whether threat or not, Nigerian airforce should reconsider Ãήϑ buy 4.5th Ãήϑ 5th generation aircraft Ãήϑ not 3rd Ãήϑ 4th generation aircraft. She shouldn’t wait τ̲̅ȍ be given a̶̲̥̅ surprise attack before she should think of modernizing I̶̲̥̅̊n̶̲̥̅̊ a̶̲̥̅ speedy Ãήϑ efficient way. She shouldn’t wait like the Soviets waited during the 2nd world war τ̲̅ȍ be attacked before weather could save them. Iranians are building their own Saegeh fighter jet, Nigeria should build it’s own even if it means borrowed technology from all over the world combined into one. Congratulations.But the big issue is can we sustain the air worthiness of the aircraft s with our poor maintenance culture? most certainly they will be grounded soon if we do not have a renewed approach to maintenance . There is nothing to congratulate. Nigeria is in the position to operate fourth generation aircraft like the Sukhoi SU-27’flanker’, MIG-29 :’fulcrum’, J-10, mitsubishi F-2. To mention just a few, but the FG chose to buy post WW II era aircraft derivatives with low range and speed. NAF does not possess platforms to penetrate deep into Cameroon, Niger republic or Benin republic their major threat (in wartime). And so does the Navy. With a range of only 600+ it cannot confront any aggression in its outer defence zone. So the FG needs a rethink. I love the development of our air but we need more jet. I am also a big fan of naf, very soon i will be a full part of her. i am happy with what fgn are doing we must not be under threats before we start arming our selves each day we ought to be prepared for war incase of any eventuality.i sugest if fgn will advance for f16s instead of f7s i would of been happier.honestly i intend to fly the fighting falcon f16 instead of those chinesh toy because they have more to offer in the day of battle. A six-man Chinese F-7 aircraft technical assistance team, which has helped the Nigerian Air Force (NAF) since the purchase of the F-7N1 fighter planes, has completed its mission in the country. Speaking earlier, leader of the team, Mr. Song Li, informed the Commander that they have completed their mission and have enjoyed their stay in the country. He added that they looked forward to having another opportunity to work with the NAF in the nearest future. Recently, the NAF procured some F-7NI attack aircrafts from the Peoples Republic of China, as part of its inventory for the protection of the nation’s air space, adding that the aircraft had been adjudged the fastest and most sophisticated by specialists within the nation’s war fleet. Purchasing planes aren’t that easy nowadays…there are politics to consider, allies few point and the person you are buying from must be willing to help you in case of any conflict. Nigeria can’t buy 5th gen. fighters from the US because in case of a war the US would probably abandon Nigeria and there would be no place to get spare parts and the planes would be a waste.